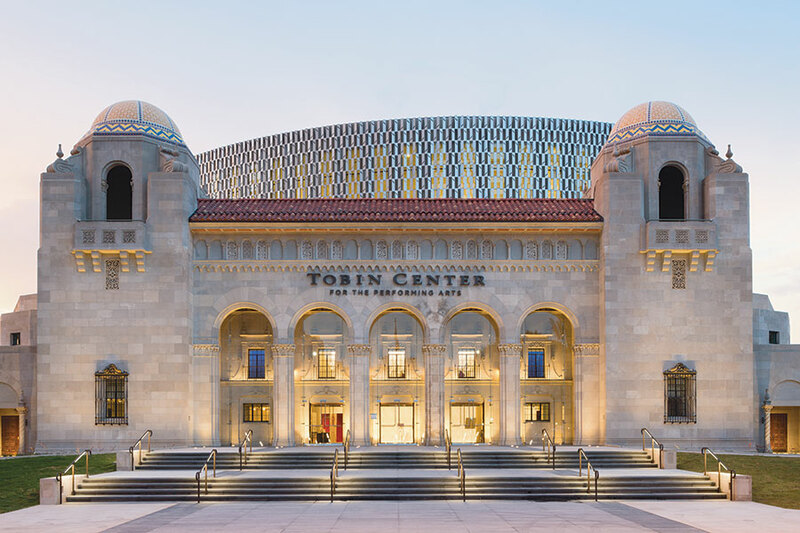 Strangely out of place, yet harmoniously so, the recently completed Tobin Center for the Performing Arts in San Antonio is the best work of architecture in the city in decades. Its closest rival, literally, would be the Central Library designed by Ricardo Legorreta in the 1990s a few city blocks away. It is a shame it has taken nearly 20 years for San Antonio to once again embolden itself with vision and purpose for its citizens. Looking at the Tobin one is first struck by the marked contrasts of the building itself. On the one hand there is the historic Spanish Mission facade of the Municipal Auditorium. And then there is the angular, asymmetric glistening folded metal screen that veils the addition, which comes alive at night with a dynamic lighting display. The project houses three performance spaces, the largest of which accommodates 1,768 people with no seat further than 150 feet from the stage. Its construction tells a tale of the changing times in architecture, where technology and craft are once again at the forefront. That is the tie binding the historic facade to its contemporary partner. 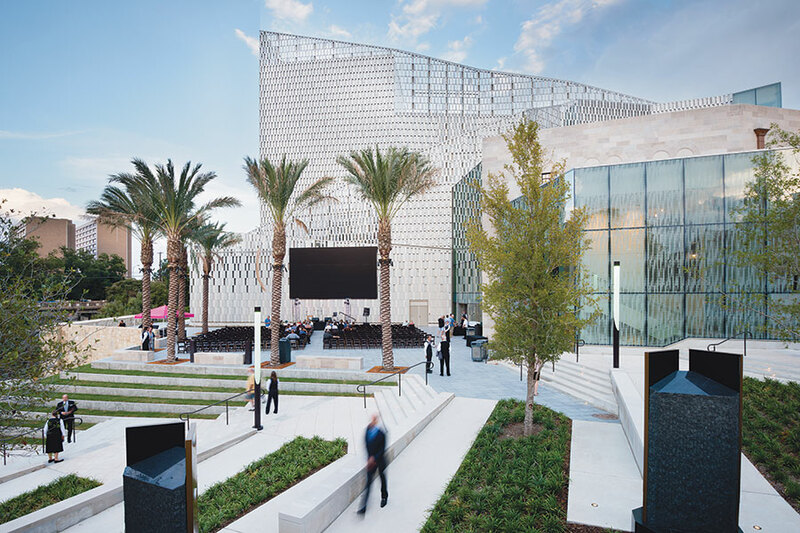 The architects preserved the historic Spanish Mission Facade of the Municipal Auditorium, while cladding the new building elements in perforated metal panels with integrated LED lighting. Designed by Seattle-based LMN Architects with local firm Marmon Mok Architecture as associate architect, the Tobin has many advanced elements that set the building apart. First and foremost is the dynamically lit metal skin that wraps the proscenium. 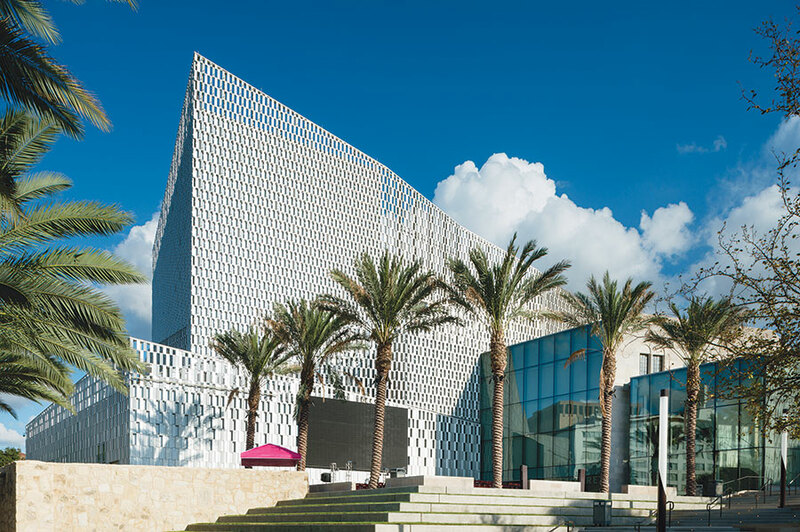 It is a complex arrangement of folded and perforated panels, realized parametrically, that screens the building’s stepped, windowless masses with a modulating pattern of 18,000 panels, 1,300 of which are unique. Forming distinct yet-interrelated volumes around the building, the veil interlocks around a triangular support beam cantilevered from the panelized weather tight primary building skin. The panels form a continuous band woven both vertically and horizontally creating a seesaw effect that allows for light to reflect in different directions. Designed with eight different panel types sized to match the existing building’s limestone blocks. The result is a facade that has dimensional qualities and a richness of lighting effects both during the day and at night. Inside the main performance hall, a pneumatic flooring system allows for the complete transformation of the stepped auditorium seating into a flat floor within 23 minutes. The sheer mechanical acrobatics that the system undergoes is mesmerizing to watch. Banquets and symphonic concerts can be pared on a single day, which opens up the possibility of endless uses and unique experiences within the main hall. One of the more noticeable and aesthetically prominent elements within the building is the integrated back-lit balcony fascias. 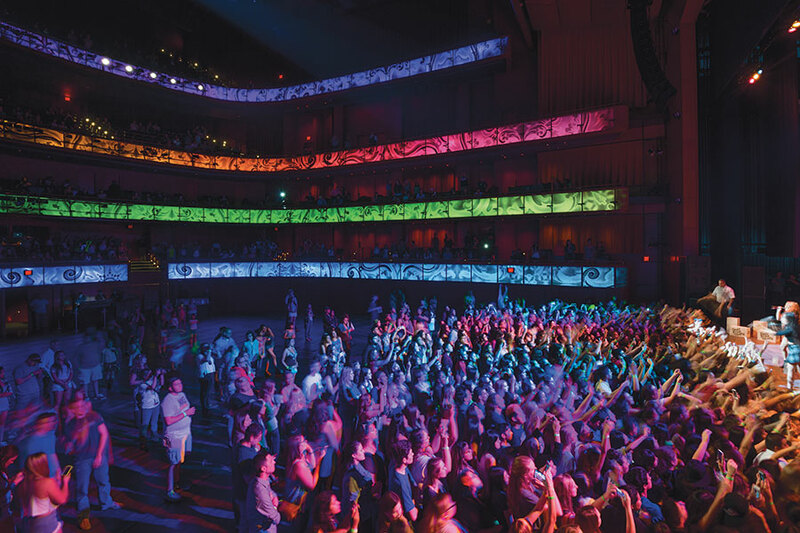 Used to signal intermissions, augment a performance with ambient lighting, or create effects, the LED illumination system with a full spectrum of color was not possible just a few years ago. This may be the single most evidently aesthetic element within the hall, one that remains in the shadows until needed. Aside from being a backdrop to the lighting, they serve as a sophisticated dynamic sound baffle system. Perforated with a vegetal pattern that repeats, the fascias absorb sound and displace it throughout the large vertical volume. Together with adjustable panels located behind the seating, they can either be programmed to control reverberation for amplified music performances, or to increase reverberation for acoustical performances. 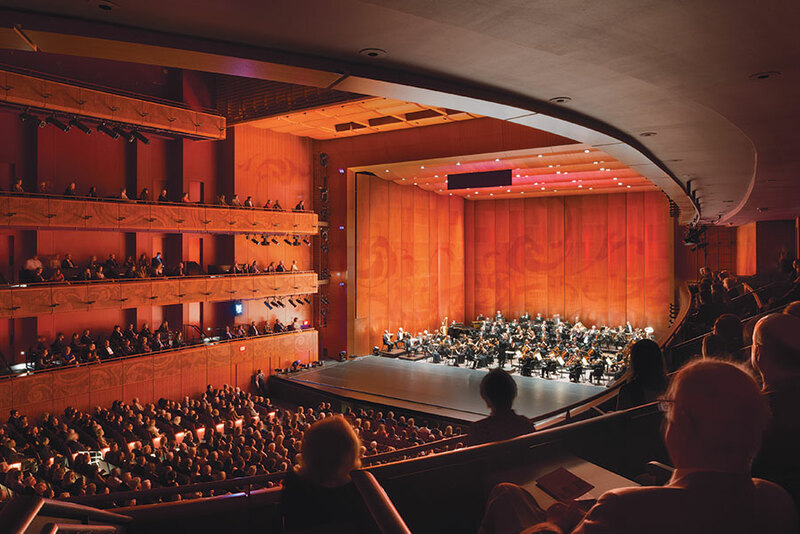 The Tobin Center showcases a development process that stems from a larger effort within the City of San Antonio. 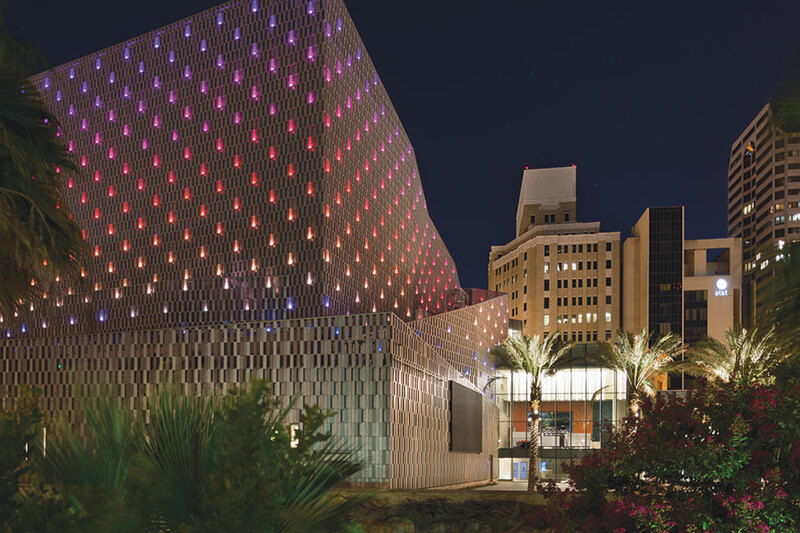 The client’s vision with clever financing made possible by the city is working to catalyze a metropolis that prides itself on its tradition of art and culture. The project successfully blends a historically important building into the present with its juxtaposition of old and new architectural elements, as well as functional and aesthetic building systems. This combination of pragmatism and aesthetic intent should serve the creative community as a model for future projects in the city.